Of all aspects related to Gaia Seed, which used to be quite inaccessible due to its rarity until it was released for the Playstation Network in 2009, the most interesting one is the way it deals with lives. It's got the usual three per credit, but each life comes with an energy bar that can withstand a determined number of hits and gets regenerated automatically as long as you're able to go on unscathed. Yes, a regenerating lifebar. Though not quite the equivalent to the dominant regenerating gimmick of today's gaming reality, that's a pretty close system that says a lot about how approachable this game is, especially for newcomers to the genre. The above is also the reason why Gaia Seed - Project Seed Trap (full title) is an extremely easy game. To put it into perspective, I 1CCed it on my first try while extremely tired and somewhat sleepy very late at night. It's straightforward enough and should present no demanding challenge for those schooled in the traditional horizontal shooter formula, kinda like a typical 16-bit title with average 32-bit aesthetics and a certain penchant for resembling none other than Darius Gaiden. If that's up your alley then this game might cut it as a feeble curiosity, in my opinion it's no hidden gem as a few people might put it. After an intro that shows what seems to be the downfall of our world through pollution and war, the player is dropped in outer space and initiates a mission to reignite the planet. A muffled English narration spoken by a Japanese fellow lends a little more flair to the strange vibe of this intro, whose spooky nature immediately reminded me of Gun Frontier. It kinda sets the tone for what's to come since the game is certainly offbeat in its dark settings and weird-looking bosses. Controls in Gaia Seed work with □/× for shot and Δ/○ for the so-called "intense fire" attack, a weapon-dependent outburst of energy that, contrary to the expected common effect, doesn't render the ship invincible – that's why I don't really consider it to be a bomb. Main weapons consist of vulcan (red) and laser (blue), switchable by taking the respective color-coded cycling icon. There are also two auxiliary weapons: green shoots out four slow-moving outward projectiles and yellow sends out two similar alternating projectiles that cause minor explosions upon contact. Both are also switched by taking the respective cycling item. When using the vulcan weapon, the intense fire attack sends out a series of homing shots that will target anything on screen, which is good to inflict damage regardless of your current position (it also melts regular bullets in its initial seconds of activation). In the case of the laser weapon what you get is a powerful laser beam that hits whatever stands in front of the ship. Once deployed, the intense fire energy bar starts recharging automatically for another use. What I did not like at all is that both gauges (ship's shield power and intense fire) occupy a large chunk of the screen and impair visibility if you need to fly low. Main weapons can be upgraded three times by sticking to the same color, auxiliary weapons have no upgrades at all. Dying strips the ship off the auxiliary shot and reduces the main weapon power by one level. While the lifebar mechanic gives players lots of room to recover from eventual hits, I'm not really fond of all those sudden laser beams fired by bosses. It's as if the game was desperately trying to account for the lack of challenge, thus requiring players to exert at least a little memorization if they want to improve their performance. Since boss fights are all timed, it would be much better if we had some sort of related bonus for remaining health and fast kills. But no, the only extra opportunities for scoring are in avoiding weapon changes (1.000 points per extra power-up) and killing all enemies in selected formations (1.000 to 5.000 points). 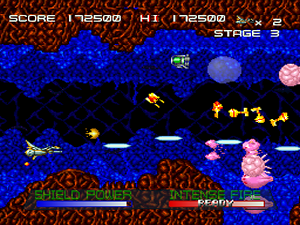 A staple of the Darius series, enemy wave destruction bonus is just one of the many aspects that Gaia Seed borrows from Taito's fish-blasting franchise. Backgrounds, boss behavior and even the soundtrack, for example, are all very reminiscent of Darius Gaiden. Of course Gaia Seed does not compare in terms of difficulty, but some boss attacks and even the way multiple forms are dealt with are hauntingly similar. Also watch out for a few enemies that seem to have been lifted directly out of the first Darius. In an interesting twist in its storyline, this game has three different endings. By beating the final boss the mission is deemed incomplete and you get a bad ending. By timing it out and then killing the secondary angel-looking boss you still get a bad ending. In order to see the good ending and a message of mission complete it's necessary to let them both live. Unfortunately there isn't any sort of scoring reward for the best ending. No matter how you see it, Gaia Seed will never be more than a quick diversion that wears off pretty fast. Most people tend to praise its music, but in my opinion it's just a serviceable one that suits the atmosphere of the game and also comes out as Zuntata-inspired at times. 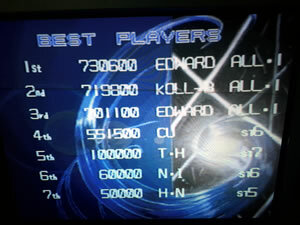 I attempted to get as many wave bonuses as I could in three consecutive credits, with the final results shown below (Normal difficulty). My preferred choice for weapons was vulcan + yellow side shots. Manual load/save and a music gallery are the most useful functions in the options menu.